As announced early last week, Porter Airlines and RTO12 will be introducing summer seasonal service into the Muskoka Airport (YQA) for the summer of 2019! Tourism business owners in the RTO12 catchment (Algonquin Park, the Almaguin Highlands, Loring-Restoule, Muskoka and Parry Sound) are invited to attend one of three upcoming ‘Town Halls’ across the region to meet with current RTO12 board members, to receive an update on RTO12 projects and the current 5-Year Regional Tourism Strategy, and to hear more about becoming a director on the RTO board. Explorers’ Edge To Host First Annual Regional Tourism Summit This Fall – Workforce development to be a highlight of the September 20th event. Join us for the regional tourism industry event of the year. Gather with industry colleagues and tourism stakeholders for a day to network and learn about industry best practices. BRACEBRIDGE, Ont. 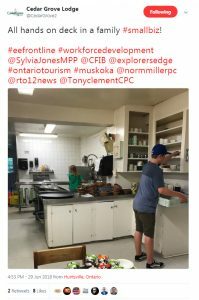 (August 7, 2018) – American travelers have another incentive to experience the Great Canadian Wilderness just a couple of hours outside Toronto this fall. 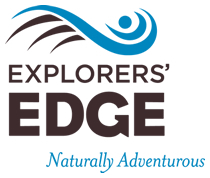 Explorers’ Edge promotion includes $200 in gas, entertainment vouchers. Over the course of July and August, 2018 Explorers’ Edge staff will be out in the region interacting with front line staff, using the hashtag #eefrontline.